My son is not a "man's man." He's soft-spoken, creative, warm, demonstrative and sensitive teen. He's not rugged or tough and he doesn't excel at sports. He is extraordinarily artistic with an amazing flare for fashion and design. He is very demonstrative, a great listener and a wonderful friend. 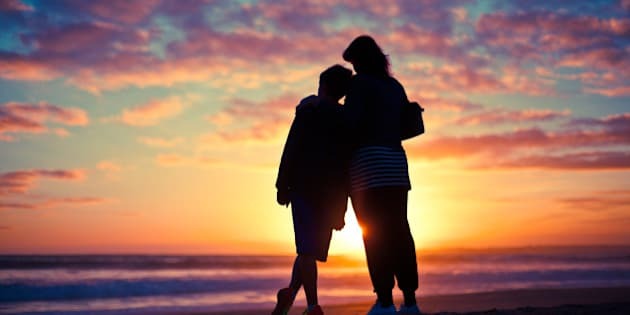 Mother and son silhouetted watching the sunset on a beach. Several months ago, I found my son in my closet. When I asked him what he was doing, he looked at me and said, "Mom it's time to clean up in here. You have such nice things but it's so messy that you can't find anything." I'm embarrassed to admit he was right. For the next two hours he diligently organized my mess. The end result was breathtaking. He is my 13-year-old middle child. He was born on a cold spring day in 2003. From the minute I looked into his eyes, I knew he was special. He is very demonstrative, a great listener and a wonderful friend. He's not a "man's man." He's soft-spoken, creative, warm, demonstrative and sensitive teen. He's not rugged or tough and he doesn't excel at sports. He is extraordinarily artistic with an amazing flare for fashion and design. In his free time, he's not interested in playing Xbox or shooting hoops on the driveway. He'd much prefer to reconfigure our backyard space, set our dining room table with elite sophistication or hang out with me and talk about life. He's not a sweatshirt and sweatpants kind of kid. He rocks colored denim, button downs and Adidas with style. While some boys get a thrill from watching hockey during the playoffs, he prefers snuggling on the sofa with a bowl of gummy bears and browsing through his boards on Pinterest. While some boys are consumed with competition and winning, he is a giver; an old soul. He is very aware of others' feelings to a fault, often sacrificing his own needs. He is very demonstrative, a great listener and a wonderful friend. He's not a typical seventh grader. He's unique -- and I think he's amazing. Sometimes I worry about the people who won't understand or appreciate him, or devalue the very sweet, creative, loving human being he is. No one shows enthusiasm like him. He's always willing to lend a helping hand. He gives bear hug accompanied by warm, sloppy kisses and a pat on the back. He wakes up with a smile and conquers the day with enthusiasm and gusto. He doesn't just put his stuff away, he reorganizes the entire family room! He truly embraces life to its fullest. His energy makes me smile. His passion makes me feel energized. His warmth makes me feel loved. Sometimes I worry about the people who won't understand or appreciate him, or devalue the very sweet, creative, loving human being he is. The adults who will try to break his spirit or make him tougher. But instead of wasting my time on the unknown and what ifs, I prefer to enjoy today with pride and appreciate my son for the amazing man I know he is destined to become.